We were having problems, one after another, and mobile electric fencing was just about the only solution I had heard of that might help us out. Problem is, those fences and their solar chargers are kind of pricey. I’m not against getting one, and in fact, we probably will next year, but for now, it was going to be a bigger project than our “right now” budget would allow. By right now, I mean that we really needed a fast solution to our predator problem, or risk losing more of our birds. The other problem is that a chicken tractor is really supposed to be moved daily. It confuses the predators and gives the birds fresh grass to eat (and a fresh pooping place…see this post to understand what I mean). Moving the fencing AND the chicken tractor that often would be a bit too much work for this year, so we needed to figure out something else. The sad remains of an attacked chicken. Something small dug underneath the front edge of the chicken tractor. It may be hard to see, but there are two holes dug where the chicken tractor had been. You can kind of see a line in that patch of green grass…that’s where the tractor was, and the two brown patches are where the predator got in. 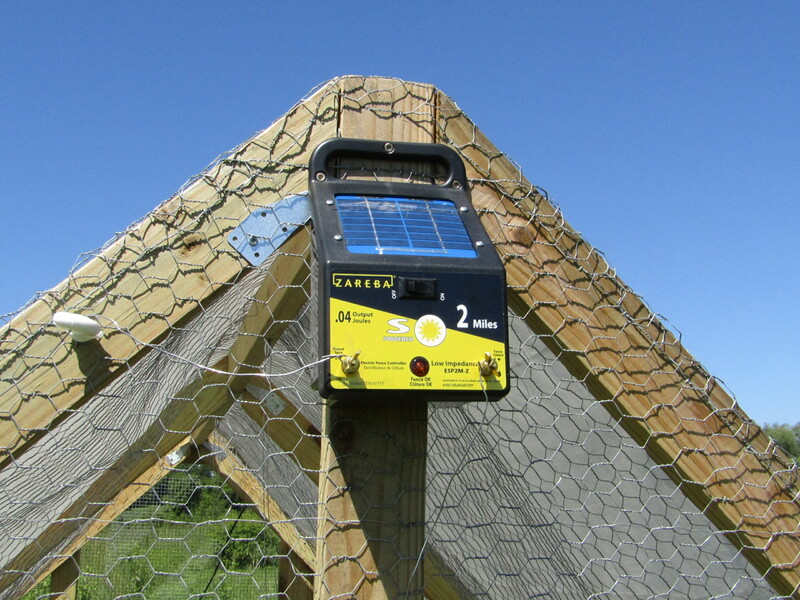 Scott spent some time thinking and researching and found a way to put the electrification system ON the coop itself. He found a video that John Suscovich did about electrifying his chicken tractors. But it seemed like his set up maybe had some unnecessary steps. John grounded his fencing in all corners of the tractor, but Scott felt that was more than necessary, and he came up with his own plan/modifications. We would not need a large solar charger since the plan was to use this exclusively to electrify the perimeter of the chicken tractors. We were able to get the 2-mile Zarbera charger, which was around $100. We also needed a grounding rod (we used something we had on hand), wire, and insulators. It cost around $125 to get ourselves everything we needed. 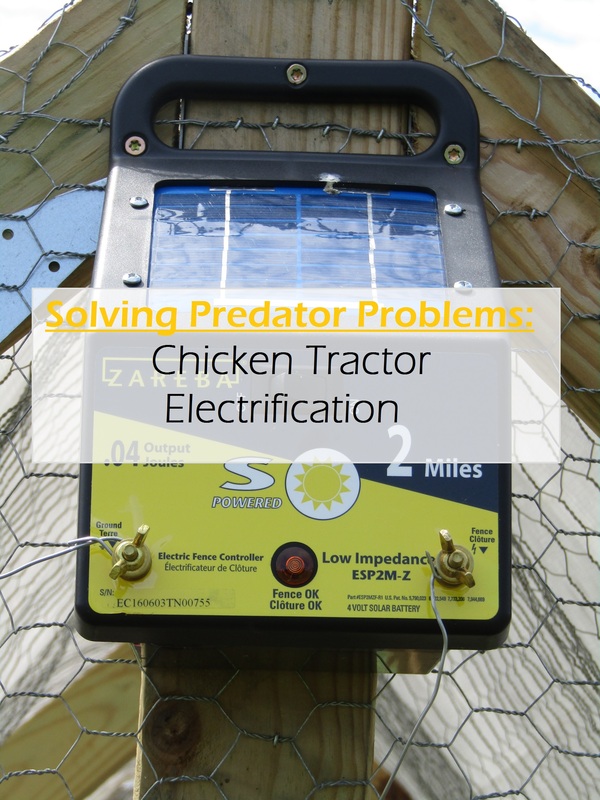 How we solved our predator problems with chicken tractor electrification. The electric fence tester that we purchased. 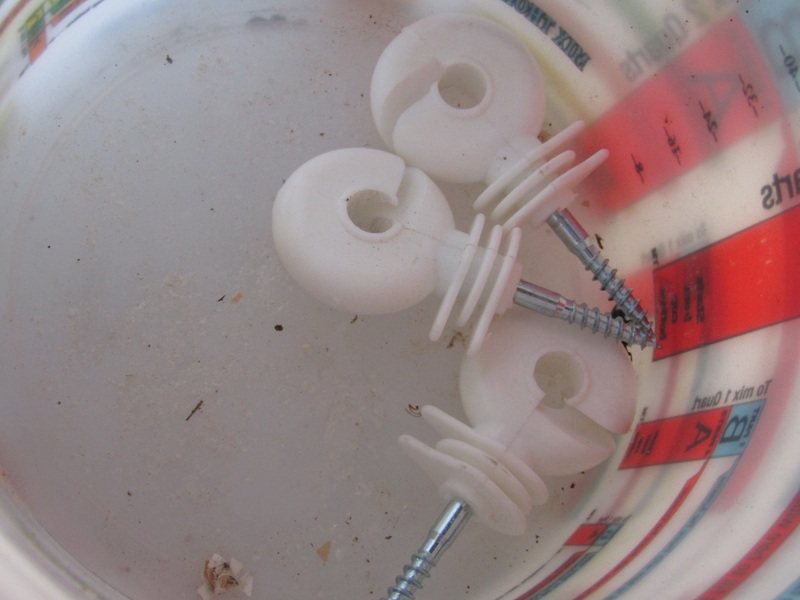 Insulators help to ensure that your fencing will work by keeping your fencing where it needs to be, and to keep it from touching things like your fence posts. 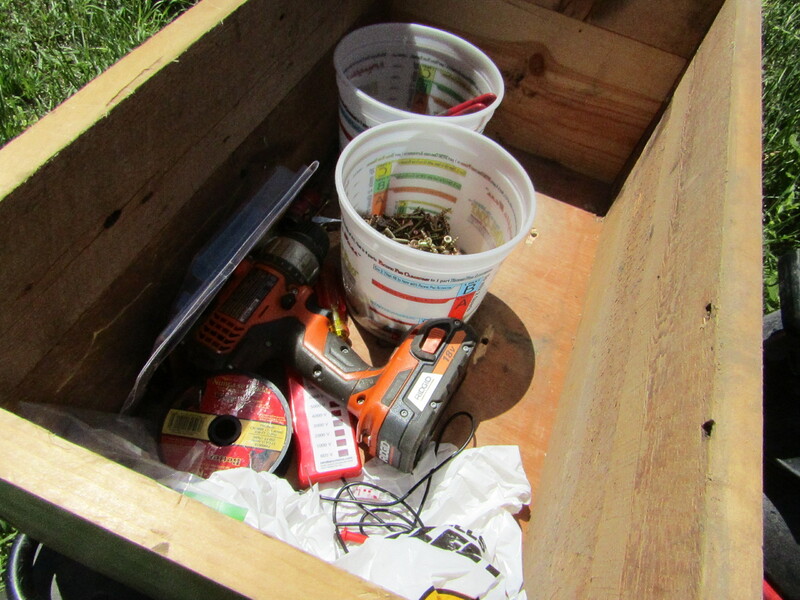 Working on this project, we needed the driver/drill, some screws, a few drill bits, and all of our materials. Scott did all of the work on this one…well, with the help of one of the boys. The goal was to get the wire mounted off of the frame of the tractor, about 6″ out from the tractor and 6″ up off the ground. He had to laminate boards outward from the frame of the tractor to get us to the right height and distance. From there he installed the insulators at the appropriate points on the frame. If you look at the corner of the tractor, you can see that he added extra 2×4 pieces to build out from the tractor to get us to the right height/distance from the tractor. That post is our ground rod, and it was not in use in the picture. 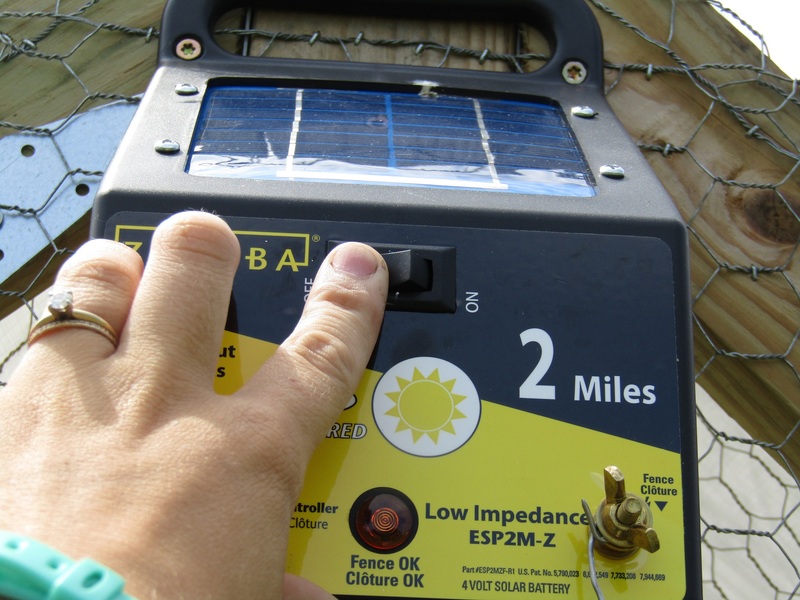 The solar charger was mounted to the tractor near the peak of the roof, and we ran our wire down the frame to the bottom of the tractor, using insulators to prevent the wires from touching the frame. The solar charger mounted at the top of the frame, and insulators running down the frame with the wire in it. There is also a length of wire that runs along the roof on the left side, back up to the charger….that is the ground wire. The wire was then run around the frame of the tractor through more insulators. It was a joined up in the back by the solar charger. 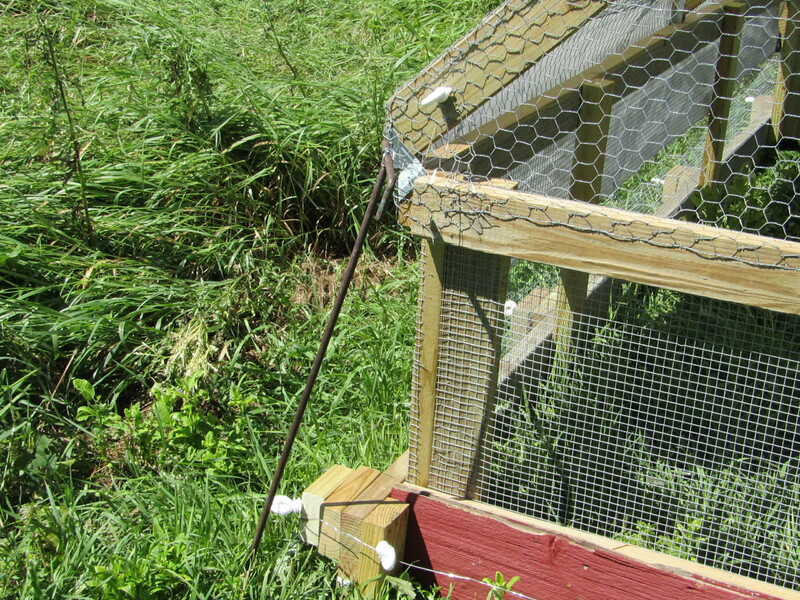 A closer look at the wire and insulators running up the back of the chicken tractor. The insulators run around the corner of the tractor, keeping the wire from touching the tractor or the ground. 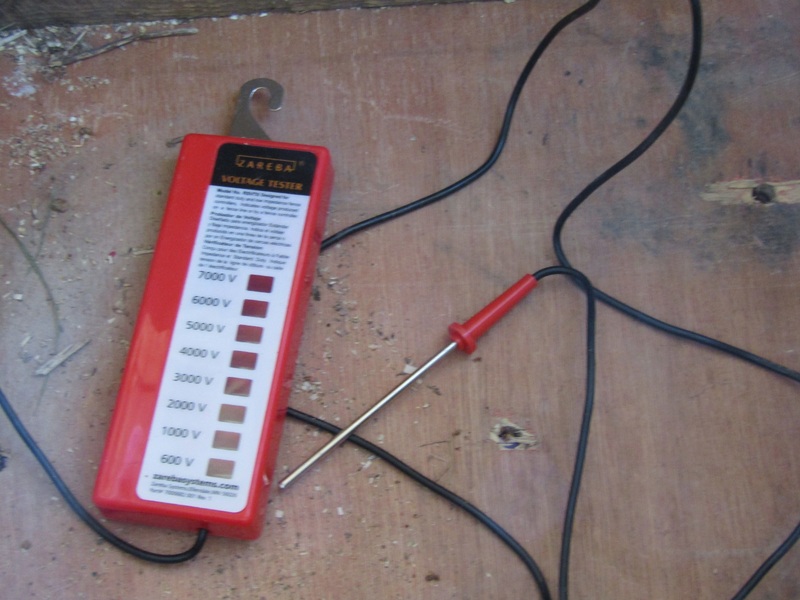 It is important to make sure that your ground rod does not touch your other wiring! In the front of the tractor, the bottom of the frame is sort of a sled, and to keep the wire close enough to the frame, we made the wire to dip in at the corners…nothing can climb over or will try to climb under if it is this close up to the tractor frame. The wire for electrification gets connected to one of the two bolts in front of the solar charger. It will say something like “fencing”. The other bolt will say something like “ground,” and that is where you will need to connect your ground wire. Connect your ground wire to the bolt that says “ground,” and your fencing wire to the bolt that says “fence.” Don’t let these two wires touch, as they will short out the circuit and cause your fencing to be unproductive. He also made an adjustment to the back board during this process. Since he needed to build up the wood on the back of the tractor to make sure that the insulators were far enough from the coop, it would not allow us to fully remove the back board from the tractor, which is actually what we had planned to do all along. Now we have a bolt that we can slide into the back board, through the built up boards, and hold the board up off of the ground for moving. The red board on the back of the tractor covers a gap between the frame and the ground…this gap makes pulling the sled easier, but it also means that a predator can get in…which is why the gap must be covered. Before we were removing the board completely, now we just leave it in place, but put that bolt through a hole in the board to hold it up off of the ground for moving. So now you need to know how we can use this system. We still need to move the tractor daily (or often) to keep predators confused and to give the chickens fresh grass. That means we need to shut off the system for moving and turn it back on when we are done. I’ll start with turning it on because if you are going to be doing this, that is what you will start with. With all of your wiring in place, you will want to start by making sure the charger is turned off. Be sure your charger is turned off before you touch anything on your chicken tractor. Put the grounding rod into the ground. Put the ground rod into the ground…be careful not to let it touch the tractor or the fencing below. Make sure that if you need to put boards in the down position on front and back that you do it now. The back board in the up position for moving. Here the board is in the down position, with the bolt slid into place. The bolt will help hold the board down should a predator try to attack. Then turn it on and test it! No, not with your hands…unless MAYBE it is your first time using the system and you are making sure there is flow…but I don’t recommend that…it will hurt. Insert the charger stake into the ground prior to testing the fencing. That little spike should be in the ground all of the way. 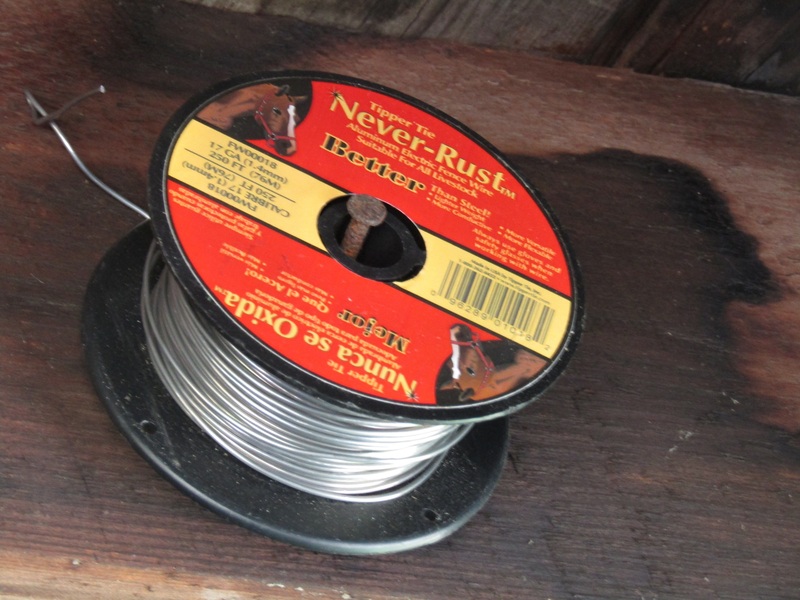 Place the hook onto the fencing wire to test. The little lights on the testor should blink. Ours is VERY hard to see, but it should be blinking somewhere between the 7,000-5,000 mark. If it’s not, it could be that your wiring is longer, or that there is more “stuff” touching your wire. The lower the number, the less painful the shock…you want that shock to keep predators from coming back! When you are ready to move your tractor again, take down is easy. Turn off the charger, remove the ground rod, and lift the boards. Then move the tractor, and set the fencing back up…maybe after feeding the birds so you aren’t dumping water onto a hot line or tripping on an electric wire. The charger instructional book said that you may not feel the shock if you are wearing rubber boots as they will ground you, but I still would err on the side of caution. Just make sure that you turn that fencing on! We have one additional precaution that we will be taking on the new chicken tractor that I am building, but I’ll share that when the tractor is done. 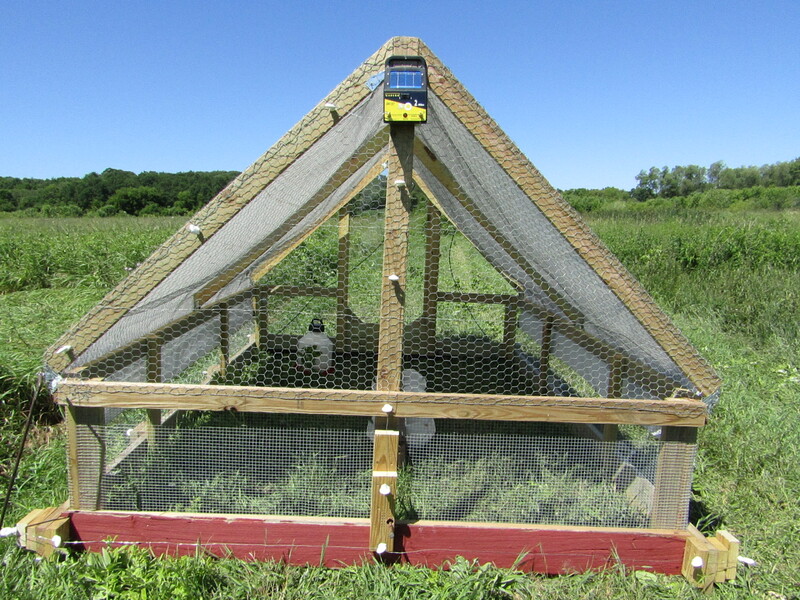 Scott is adding chickens back into the chicken tractor after the electrification was set up. These three little guys experienced their first taste of grass that day. The big chickens wasted no time in finding the feed. As crummy as it is that we lost so many chickens this year, I think we learned a lot and every time we fix something, we make our chickens a little safer. I don’t want to give up chicken farming, so finding other ways to keep them safe is worth the effort. I don’t know how long the solar charger life is, BUT if we raise 100 chickens a year for 5 years on that charger, we are talking about a cost of about$0.20 extra per bird to raise them. I’m okay with that. The good news about this electrification system is that it works. The bad news is that it does not work if you forget to turn it on. 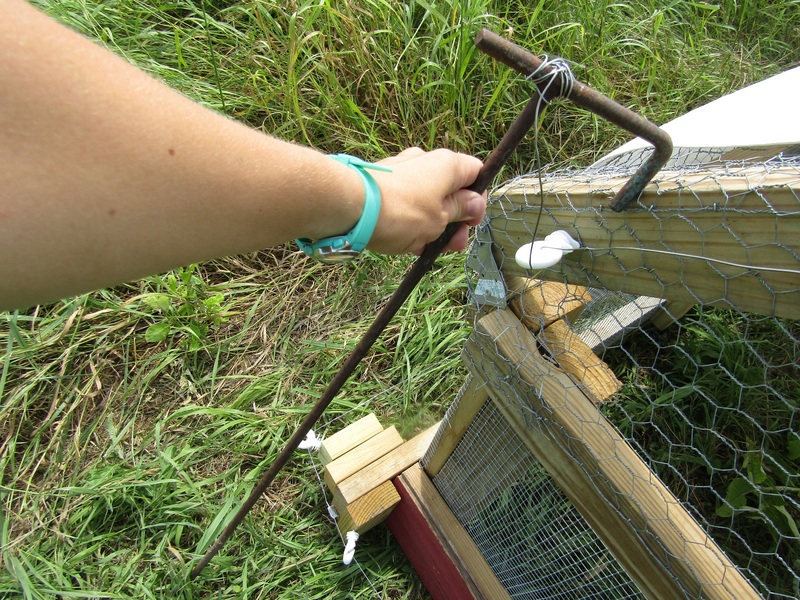 We had to come take some measurements from the coop so I could finish building the second chicken tractor, and when we did, we turned the fencing off…and forgot to turn it back on when we returned. There were 6 chickens in the tractor at the time. We didn’t want to put in too many in the event that the electrification was not working, so we were giving it a trial run. For 4 nights, we had zero issues. The night we forgot to put it back on…3 dead/missing chickens. Lesson learned. 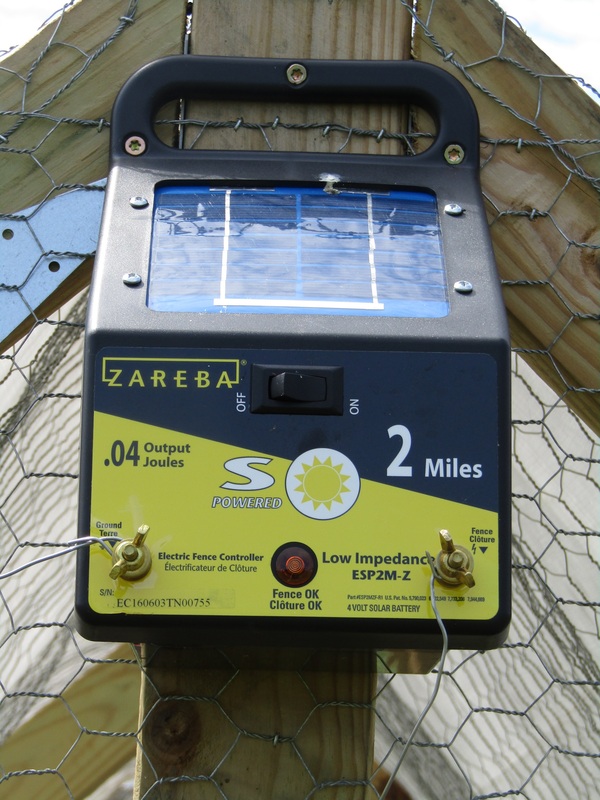 Always make sure the solar charger is ON before walking away from the chicken tractor!!! After more days of testing this system after the loss of those chickens, we felt confident that the system was working, so we added the remaining meat birds to the tractor…it’s something like 24 birds (out of 100) that we had left. But we are not giving up! We found out we had a problem and figured out a way to solve it. Now we’ll just need to continue to be diligent in watching for signs of trouble. If you decide to try our electrification system out, be sure to let us know if it works for you! And let us know if you have any questions comments…we always want to hear from you! Have any of you tried something similar before? Thank you! That was really informative. We have a horrible predator problem. We used to have the best varmint-chasing dog but he met a bad end. 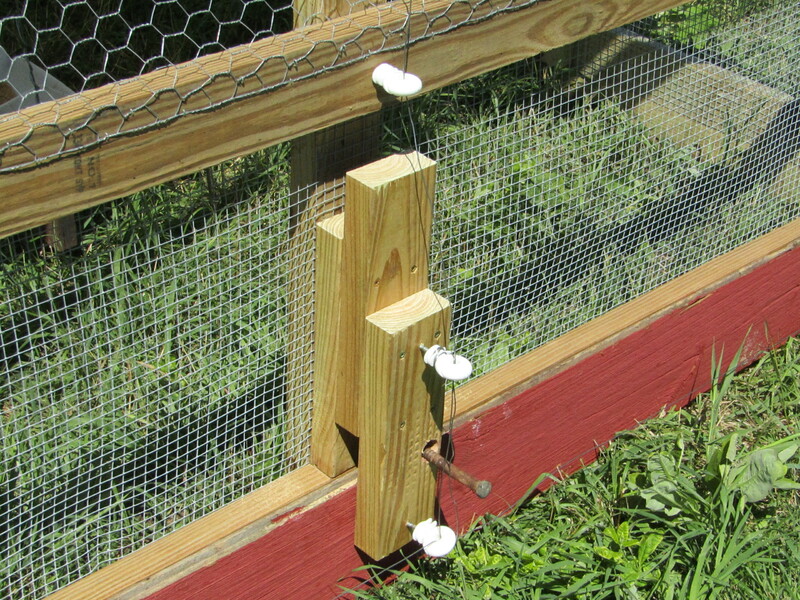 One thing I’ve learned: chicken wire only keeps chickens IN, it doesn’t keep predators out. We’ve changed to much heavier fencing – but I wouldn’t think of putting them “out there” in a chicken tractor without electric fencing too. Your place looks like ours, very wild! Sorry to hear about your dog and the predator problem. I am so thankful we seem to have found a solution that works. The animals are always safe the first day or two or even week that they are out there, but once the predators realize they are there, they don’t leave the chickens alone. It is fun to follow your blog and I am simply amazed at the time and effort you put into making things work. I had to learn all about how to keep the animals/predators out of the barns and house and over the years fine tuned it. As far as your ‘grounding rod’ those were made for the use with a hunting ground blind. The ideal behind them was that a person in a wheel chair could use them, remind me to tell you about that when we talk the next time. I had at one time 8 of those and although the hunting blind is long gone I used the rods for various things around my place. Thanks! Yes, it’s always an ever-changing process for keeping predators at bay…if it’s on one predator, it’s another. Ah! That’s what they were for! I thought they reminded me of a stake of some sort. I will have to try and remember to ask you more about that. I think we have a total of at least 4 of them (including the one we are using). I hope that works for you. You’re right in that it’s really frustrating and upsetting to lose your chickens to predators, and there are so many of them! I get discouraged trying to protect my animals and plants from pests and diseases sometimes. It’s tiring. Yes, it really can be exhausting! J > There’s one thing we can rely on chickens for : to make life much more complicated than we ever thought could be possible! That is very, very true!